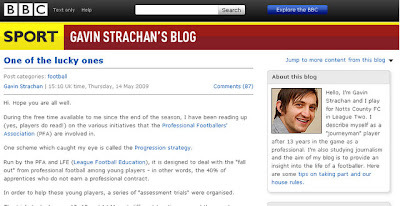 The name - Gavin Strachan don't seems to ring a bell to most of us who are more familiar with Rooney, Stevie G, C Ronaldo etc. Neither do I, after all, Gavin described himself as a "journeyman" footballer plying his trade in the lower tier of the English football for years. But here's a player who planned well for his career after the game by studying journalism during his spare time and therefore the BBC blog which he maintaining is what he making use of what he learned. Inside this blog, Gavin shared with us his insight as a lower tier football player far from the glamorous lifestyle of that of those Premiership millionaires. So one thing came to my mind instantly - how many of our local footballers tried doing this before? None? I do came across some so-called "star columnist" appeared on the papers occasionally but none of this like what Gavin is doing as these column mainly dealt with match preview, analytical type of dull stuff. While I'm not trying to ask our local footballers to do something like what Gavin is doing but I felt there are other meant of sharing with us, the fans, what and how they going about with their non-footballing lifestyle. 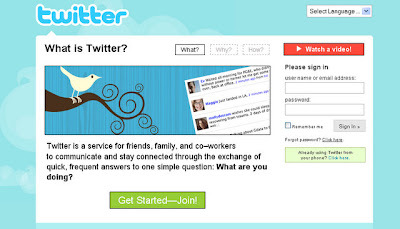 Entering "Twitter" - the microblogging sensation that taken the world by storm, this is definitely an unique concept that user can update their "tweets" either via their profile page and the best thing, of course, through their mobile phone. Then again, the drawback about "Twitter" is that you can't upload picture from your profile page without using a "third-party" tool like "TwitPic". 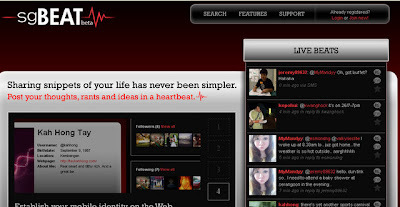 So recently, as you all been noticing that I been utilized this new microblogging site - "SgBEAT" to do my live streaming match update and the beauty of it - you can upload your "beat" (equivalent to "tweets") using not only your mobile, through your profile page but users are allowed to upload picture together with their text! It'll go on and on if I go further in details, so jump into the bandwagon using these neat tools and "Feel Free 2 tel us abt urself". Nice content of the blog. Which is why I think using micro-blogging is a good way to reach out to the fans for these players..